This is a view of the parish church of St Mary’s at Hanwell. The medieval village of Hanwell developed around the church here and at this time the parish probably included New Brentford and the area up to the Thames. 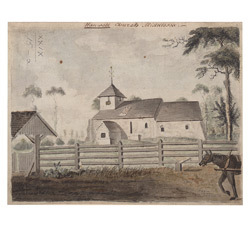 The original Hanwell Church was a small thatched building which was replaced in the late 18th century with a larger building which was designed by T. Hardwick. The present day St Mary's Church was built in 1841 by Scott & Moffatt.